Ever since seeing the NEMO® Bugout™ shelter at Trail Days in 2012, I’ve been wanting to get one. 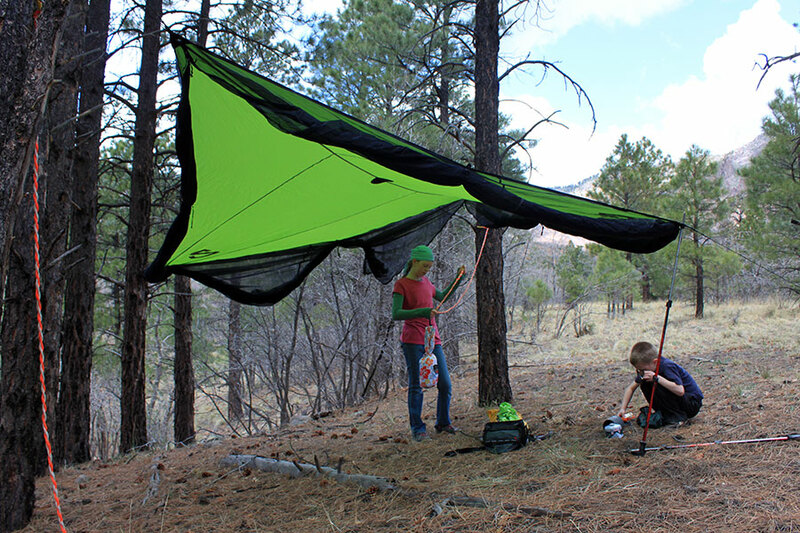 The Bugout is a tarp-based shelter with an integrated bug netting that reaches from tarp edge to the ground, creating a roomy, 4-sided no-see-um enclosure. 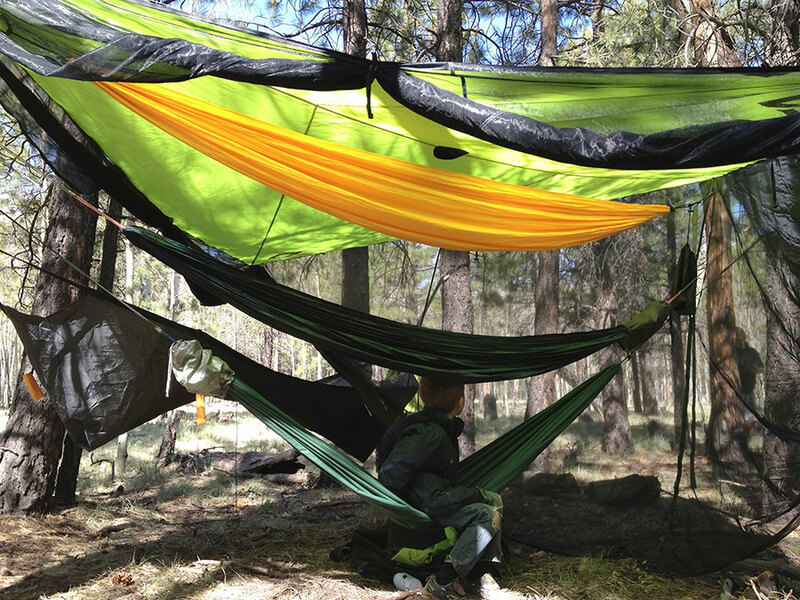 When I saw it, I immediately drooled at the hammock camping possibilities[1. Admittedly, I look at most things with hammock-colored glasses, but the Bugout jumped out as perfectly matched for hammocks. 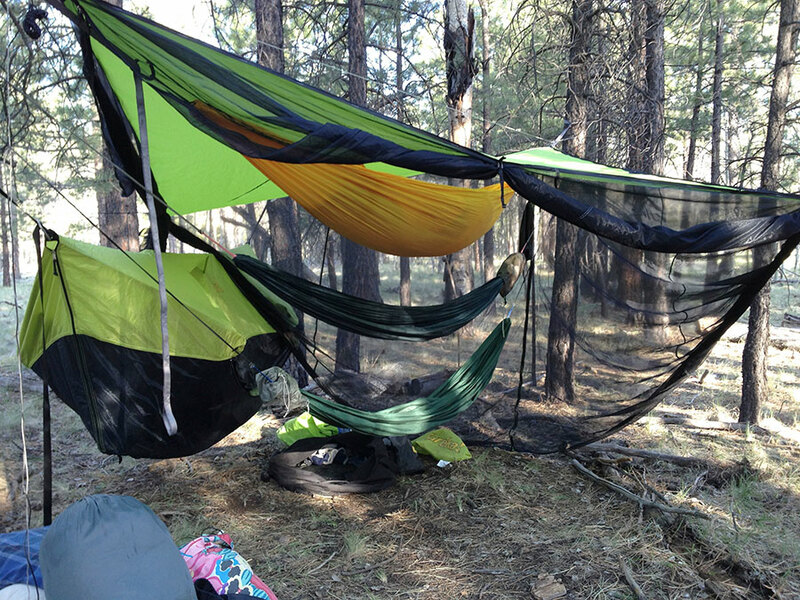 ]: multiple hammocks strung up in a bug-free palace. The 9×9 ft (2.7×2.7 m) shelter is perfectly sized for hammocks, providing more than 12 ft (3.6 m) on the diagonal. 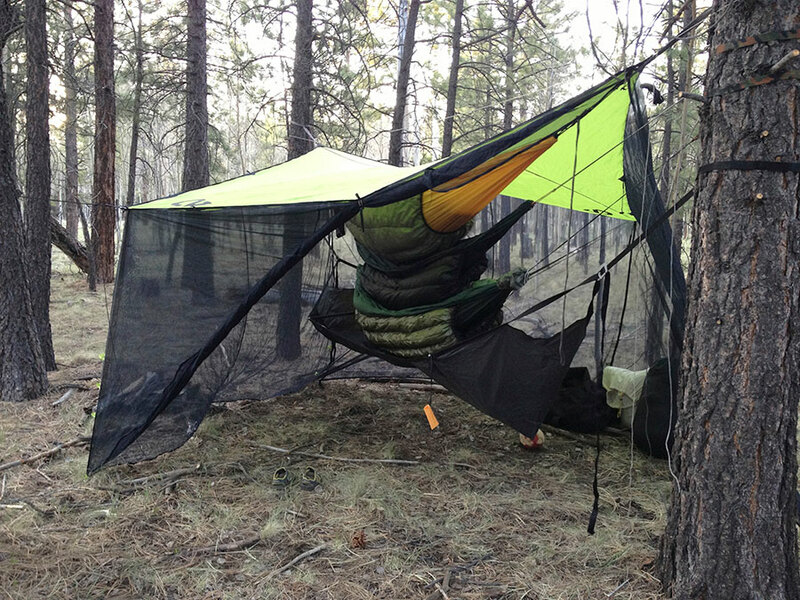 With the “floor to ceiling” bug netting, the Bugout can be pitched high enough to fit multiple hammocks, if necessary, and is very comfortable with one. There are stake loops along the bottom edge of the bug netting, and a few daisy chain loops along the corners allowing me to stake down the edges and allow for sloping the sides. It’s actually a very thoughtful design approach. This thoughtfulness, or attention to detail, is evident in every area of the tarp, and has made me appreciate the NEMO design team even more. The bug netting, for example uses a unique tie system so the bug net can be rolled up when not needed, or for ease in packing. At each corner, and on the sides between the corners, are tie-offs, but done in a very unique way. Instead of two strands of cord to tie, the Bugout uses a cord lock as a toggle system using just one ribbon and a loop. The cord lock is attached to the ribbon and is then inserted through the loop, thus trapping the bug netting. The cord lock makes cinching up the bug netting very secure, easy to set, and quick. The Bugout features unique “gutters” that channel water down the edges. Another unique design element is the edging around the perimeter of the tarp. The edging has been sewn in such a way as to create a “gutter” that can channel runoff along the edge to the corners where it can drain off. It’s simply brilliant design. There are four (4) guy lines attached to each corner. The guy lines have a reflective tracer. Each line is 17 ft (5 m) long and weighs 22 g (0.75 oz). These lines are long enough to easily reach trees or anchor points several feet away. I look for anchor points that provide at least a foot from the ends of the tarp, so I had plenty of guy line to reach around some thick trees with room to spare. The Bugout I tested had two zippers on each of the two doors. In order for a hammock to be securely positioned inside, the zippers must close down on the hammock suspension to seal off the bug net. Unfortunately, the zippers track toward each other instead of away. This means that the Bugout zips top down and bottom up. When the zipper pulls meet in the middle, there is an opening at the bottom of the bug net and at the top. 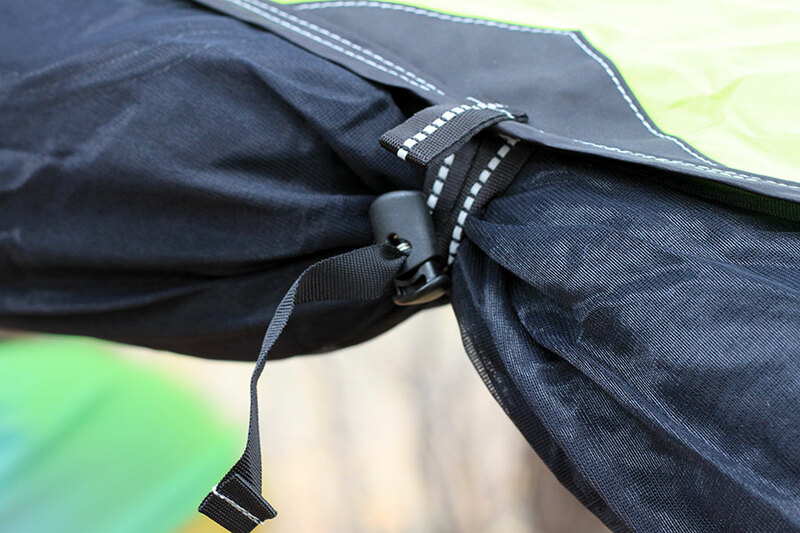 The hammock suspension can run through the top hole, but it is not possible to seal it off completely due to the way the zippers track. NEMO representatives I spoke with told me that the 2013 models have some improvements, including a third zipper pull that allows the netting to seal off around hammock suspension. One interesting feature on the Bugout I tested was the presence of four (4) large metal grommets on each of the corners. 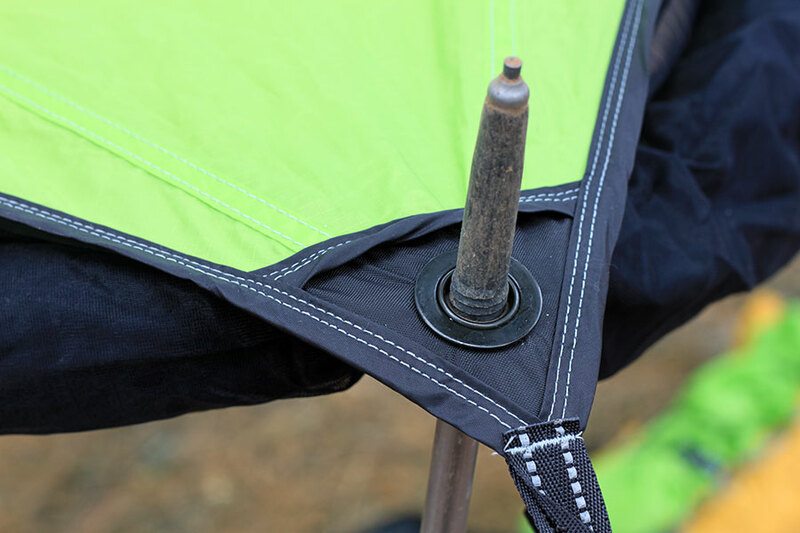 The grommets are perfect for setting up a trekking pole, for example, to hold up the sides of the tarp. 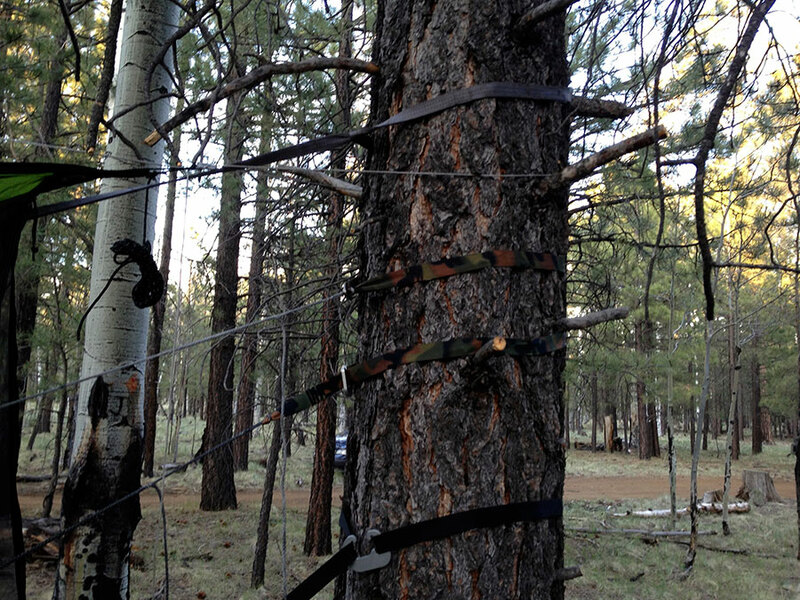 In some areas where I tested the Bugout, I was able to use the guy line to pull up the tarp without needing the poles. In locations without perfectly spaced trees, being able to use poles to create a “porch mode” on the tarp is convenient. 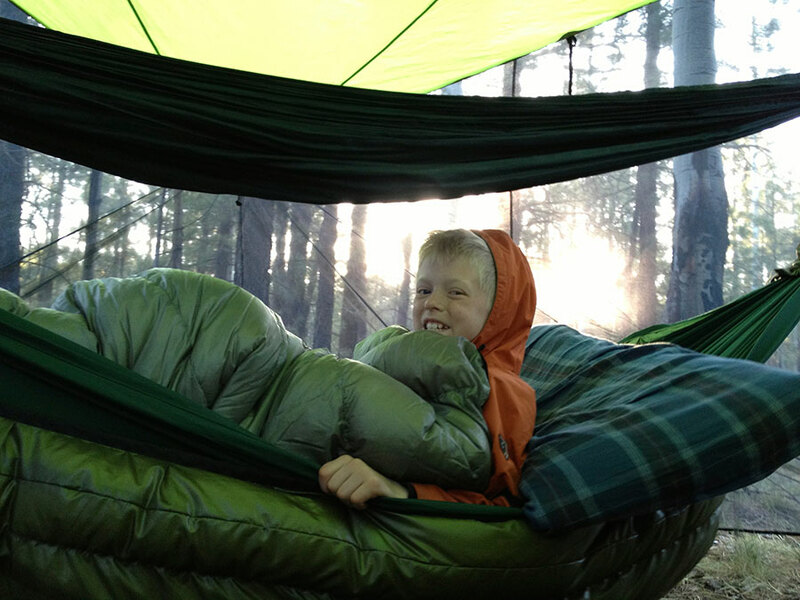 On a recent camping trip, I took my three oldest sons with the intention of all of us hanging bunk style under the Bugout. 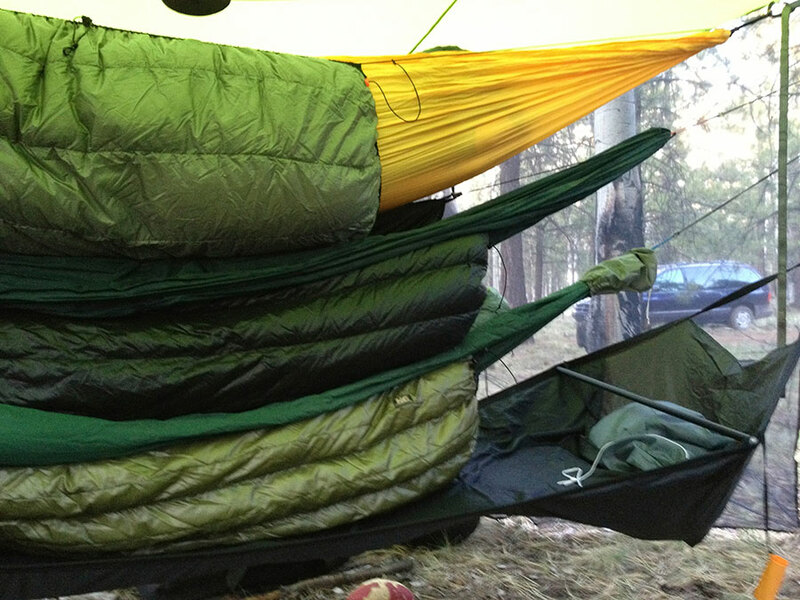 Ideally, hanging two hammocks bunk style is about the limit in terms of head room and access for grown ups. But with small children, I’ve been able to bunk up three hammocks and not have a problem with head room or access. For this trip I wanted to push the limit by hanging all four of us. The only way I could do this was to go “high and tight,” but also use a bridge style hammock on the bottom. The bridge hammock doesn’t have the same sag distance as Mayan-style hammocks so it worked out well. However, my two sons in the middle complained that they couldn’t see, so I ended up moving my hammock off to one side and adjusted their hammocks with more distance and this worked perfectly. Where I currently live, I’m fortunate that the bug count is usually low. However, we were pestered by gnats and flies on the trips I used the Bugout, and the netting worked perfectly to give us a nice sheltered area. With the hammocks set, I was concerned that I couldn’t completely seal off the netting, leaving about 12 in (30 cm) slit near the top. However, we didn’t have any flying bugs make it into our shelter, which was nice. The netting takes the lion share of weight and bulk on the Bugout, no question. The stuff sack is appropriately sized for the tarp, but it takes some effort to stuff it. I think this is due to the netting, which is a little stiffer and harder to work with than the fly. At a little more than 4 lbs (2 kg), the Bugout is not the most trail-friendly in terms of backpacking, but it’s a great addition to car camping, base camping, or other event-based adventures. 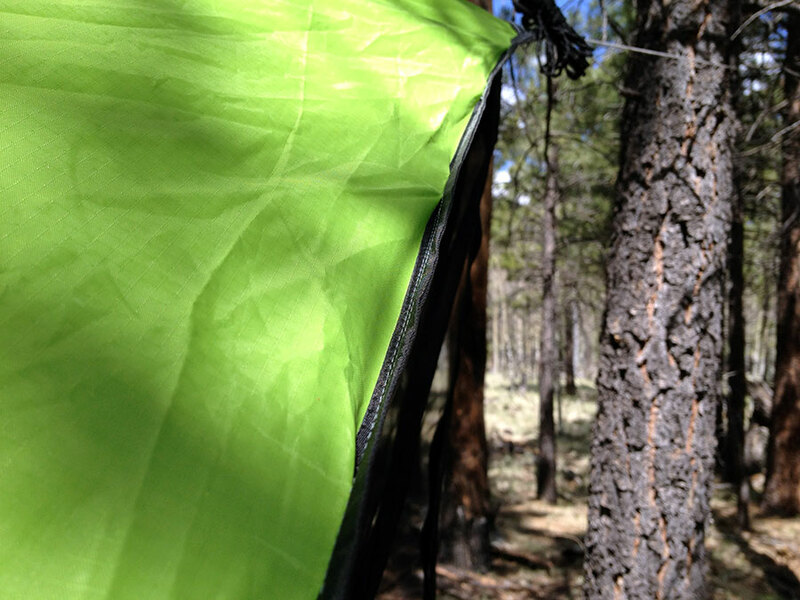 The NEMO Bugout 9×9 tarp is a great shelter and one that I’m happy to keep in my gear closet. It’s easy to set up with one person and yet it provides shelter, shade, and bug protection for a family. With the bug netting deployed, the Bugout creates an enclosed space that feels safe and familiar, like I’m in the backyard and not miles away from any home or road. I was actually surprised by how comfortable I felt when surrounded by the bug netting, yet I could see clearly out in the woods and connect with what I love about the outdoors. I love the attention to detail: the toggles to hold the netting, the rain gutters, the generous guy line with reflective tracers, the hang loop on the ceiling, etc. I’ve enjoyed testing the Bugout shelter so far and I can’t wait to bring it out on another adventure. Great review. Love your site 🙂 one question though, how do you get in and out of the upper hammocks? While I don’t normally recommend stacking any more than two hammocks high, it really isn’t that difficult to climb them like a ladder, when they are really high. In this case, it isn’t so high that I couldn’t jump in to it. But these hammocks were hung for my kids so I just lifted them into position. Hello, love all the information on your site. I’m just getting into hammock camping (after I had a better nap in a friend’s hammock than I’ve ever had sleeping in a tent). My girlfriend and I regularly backpack and car camp with our dog and the BugOut looks like it might be a feasible tent replacement for the three of us, providing we stack two hammocks and figure out a wind/blown-rain break for the dog (we see pretty chilly wind, sometimes). It’d be heavier than our current setup but the potential offset of better sleep should outweigh the downsides. Would you reccomend the Nemo for that, or might you recommend any alternate insect-proof setups for two hammocks and a dog? I’m sure he wouldn’t mind sleeping out in the rain but biting flies and ticks make us all miserable so we’d like to keep him comfortable. The only other idea I’ve had is to set one of us up in a standard mosquito-net hammock/tarp and, under another tarp, set up a pup-tent-style ridgeline-to-ground net that the mutt could sleep under. We’ve been struggling to figure the logistics of all the different components and I gotta admit we’re a little stuck. Thanks! Yes, I think it would be good, especially when sharing, including your dog. When you can split up gear between people when backpacking its a win. I’m using the Bugout with the scouts this week on our 50-miler hike. 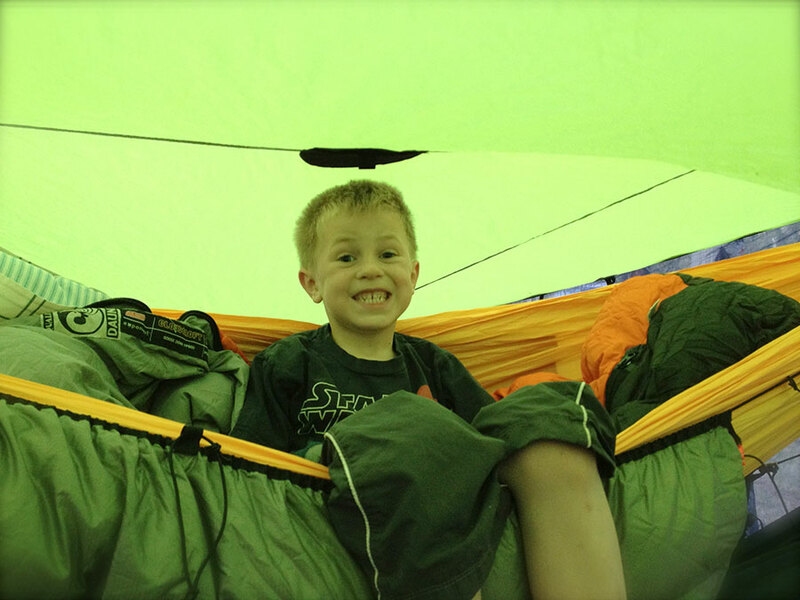 With two scouts bunked with light and simple hammocks it works great. Lots of room for dog as well. 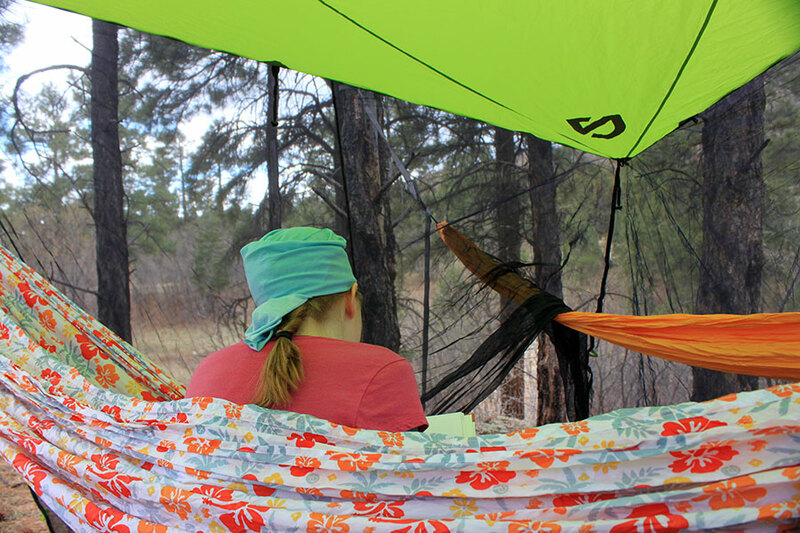 What type of hammock set up are you using off to the left of the tenth picture? Thanks! Are you referring to the bridge hammock? That is the Eureka Chrysalis.